The screw heads are sticking out. What to do before painting? We just had custom kitchen cabinets made and installed and we are happy with them so far. 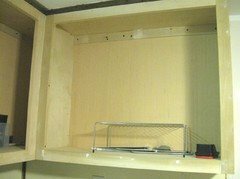 On the top insides of the cabinets, there are structural horizontal rails holding the cabinets to the wall studs. All of these rails have screw heads sticking out by 1/8th inch and we tried to screw them tighter to be at least flush, if not counter-sunk, but--they--will--not--go--any--further. Frustrating. So we are kinda screwed here. What can we do to cover the screw heads before painting such that the paint does not crack or experience issues? I am worried about using caulk because my experience using caulk showed me that it shrinks, cracks, and shrivels up even when not exposed to water, sunlight or elements. And if it does that with paint on top, it will cause the paint to crack. We will be using an alkyd paint (INSL-X Cabinet Coat) and a compatible primer, most likely oil-based Killz. They do sell plastic screw caps, but those screws should not be sticking out. I would call the installer to fix this issue. Is this in a spot that will even be visible? Before and During Bathroom pics...what else would you do? I know this may be a silly question, but to add to my question above- staining vs painting. I am nervous to paint it because it will be hard to get all the wood inside the window (not just the trim) and then I worry the paint may make it stick. Would staining be a lot thinner and I would not run this risk of sticking? POLL: Do you stick to your budget when renovating? Cabinet cracks on screw holes: acceptable? I came up on this site because I too have cracks in the box frames from the screws in the hinges. I will take pictures and post them tomorrow . Also they put shimmies in between some hinges and the Box cabinets in order for them to fit properly I assume. the inside of the cabinet's are finished with some laminate &amp; some wood. They're not consistent. 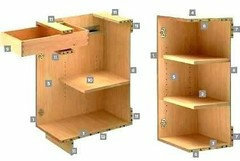 The cabinet that was made for garbage and recycling one side's wood and one side is laminate. here's A photo of my "PANTRY". some of the shelves are solid white laminate and some are laminate and white on one side and maple look on the other side. so there's not a consistency of the inside of the cabinet's being all one color laminate on the shelves either. I purposely hired an independent cabinet maker feeling that I would have a better chance at getting what I wanted. Expecting to have quality and expecting a relationship with the person that was making the cabinets. Corners and edges were not flush in ta few areas of the cabinets . The Cutting Board that was made is not flush with the island so it sticks out that is due to the wronh brackets rather than corner Slack brackets at the end they are rounded so it prevents the board from going in all the way . ( I will take pictures of this as well ) My concern is this is a second time having him come back to fix things and I see more issues this time when I called him then I did the first time I feel like it's just a half a$$ done job and quality isn't even worth fighting over. I'm considering just take a hit and tell him leave it as is have somebody else fix it and keep of the other third of his money due. I just can't imagine it getting better with things that should have been done right the first time. I'll have more pictures tomorrow and here's my pantry! I got screwed over. I need advice on what to do. Adding leveling compound to old concrete is tricky. They often times don't stick to one another unless other chemicals are involved. A properly done application INCLUDES: 1) Moisture testing over several days with a copy of the results GIVEN to the home owner. Part of your 'purchase' includes the results. It is your slab, you paid for the test, you own the results. 2) Either shot blasting or heavy sanding of the original concrete to get it NICE AND ROUGH...a shiny slab is a slab that will NOT ACCEPT leveling compound. 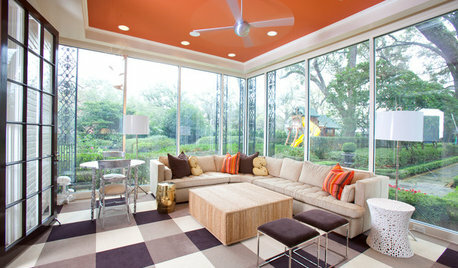 A 1000sf is several hours of work just for this process. 3) If the moisture levels are a concern (see step #1) then the installer will use a vapour or moisture barrier applied to this roughed up concrete (and allowed to dry). 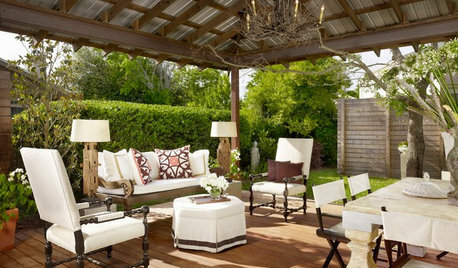 Some of these materials require a few hours between coats...and 2 coats are often required. 3B) Sometimes a primer is needed over the moisture barrier, sometimes not....it depends on the manufacturer of the sealant AND THE leveling compound. 4) If no moisture barrier is used, then a primer (something that is recommended by the manufacturer of the leveler) is used and allowed to dry/cure (can be several hours). Once the primer is dried/cured then the first layer of leveling compound is applied. These products have minimum thicknesses and maximum thicknesses that can be applied in one coat. 6) Second and third layers are added (with enough time between each layer as required by the manufacturer of the material) until the floor is leveled ENOUGH to the client's specifications (the homeowner has to tell the installer what type of flooring is going to be applied, so that the person can work to a specific requirement). 7) Leveling compound is allowed to cure. The average is 1 day of cure PER millimeter. That is where the 1 inch of concrete = 30 days to cure comes in. 1 inch = 25.4mm (which is roughly 1 month of cure time). In essence you have 6 hours of work + 15 bags of leveling compound. If you add up all the time it SHOULD have taken, you can see the amount of time spent on your slab simply wasn't enough. Not to mention the lack of testing/sanding/cleaning/sealing/priming. There are SEVERAL DAYS worth of work &quot;missing&quot; as well as several thousands of dollars worth of labor/materials missing to get the leveling compound to properly adhere to the slab. 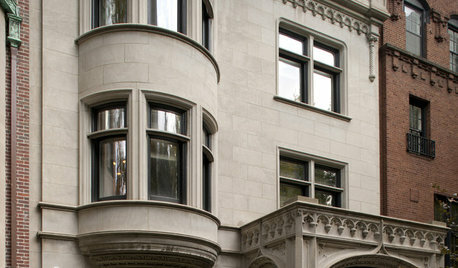 A job like this (assuming you need EVERYTHING I listed) $3-$5/sf and SEVERAL DAYS to complete. And BTW: the technical data sheet states that any subfloor TOUCHING earth (concrete slab on grade = touching earth) must have a damp proof membrane and the concrete RH must be LESS THAN 75% ... that is equal to the Sahara. The installation instructions also state that all applications (that you normally see with concrete slabs) MUST BE REMOVED...that means sanding/shot blasting. So all of my pointers above are REQUIRED...which he didn't do. And the coverage of a bag = 4.2sm (roughly 45sf) to a depth of 3mm. Your floor SHOULD HAVE HAD 26 bags....hmmmmm. You have HALF of that. That means the THICKEST he used = 1.5mm. And the instructions CLEARLY STATE that 2mm is the THINNEST it can run. Ohhhhh dear! Aaaaaand it MUST HAVE primer....ohhh no he didn't! Sorry for the long rant but this GETS MY GOAT! I'm sorry to say but the quote for the work was wrong and the work for the project was wrong. How the two of you duke this out, is going to be very interesting. The project needed a budget of double what was paid...and it required SO MUCH MORE than what was done. Paint won't crack if the caulk is dry before painting over it. I can't imagine how caulking over exposed screw heads will do anything to hide them though. Can you post a picture of these screws. If they are round-headed screws, they won't counter-sink. If they are flat-head screws, they should have been counter-sunk. 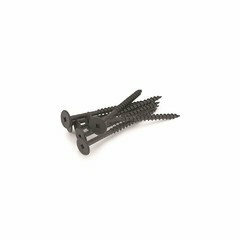 If they are rounded washer-head screws, they are meant to sit out from the rail. If I'm installing a glass door cabinet, I purposely paint these heads to match the interior cabinet colour so as not to be as noticeable. 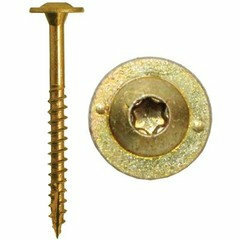 There are various ways to cover screw heads depending on the screw used. PhOto? I am confused...why are you seeing screwheads, are you seeing the rail? I’m confused too. There should not be screws sticking out. That is beyond questionable. There should not be unfinished cabinets in your kitchen either. They should have been finished by the cabinet maker off site. Then installed already finished. Please post a picture. It is unclear where these screws are. Are they the screws holding the cabinet to the wall? It's highly unlikely that a custom built cabinet is using a rail system like you would see with Ikea or some other RTA's. It's more likely that the custom shop is using a standard construction method seen in the attached. #7 is a cross member or rail which is a 3-4" strip of wood in which the screw will go through into the studs. Screws will be visible. Caps have been designed to hide the screw heads. Some companies may use a solid 1/2", 5/8" or 3/4" back in place of the strip/rail which would allow screws to be placed anywhere on the back rather than only at the top or bottom where the rail is. 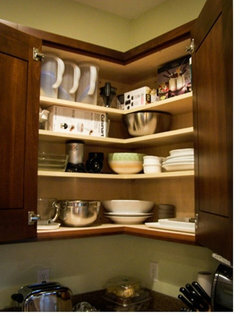 If the cabinet is built with wooden hanging rails instead of a structural load bearing back, the rails should be dadoed into the cabinet sides on the cabinet exterior. The interior should be flat and smooth, with a thin non structural cabinet back providing a nice appearance. All of these box materials should be manufacturer prefinished with either melamine or a clear coat. 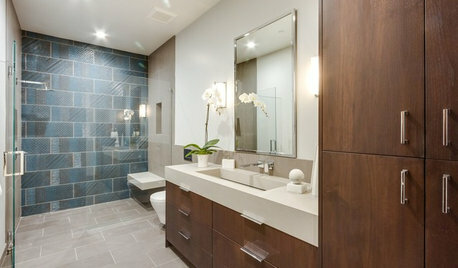 Only the faceframes, doors, and exposed flush finished cabinet sides should require finishing. All finishing should also occur in the cabinet maker's finish room with proper ventilation and professional grade materials. There are a lot of things in this post that need to have pictures to better illustrate. Just the words alone leave a lot of questions from the flags raised here. I apologize. I'm probably using incorrect terminology. I'm reading this while at work and therefore am unable to post a picture tonite. I made a quick sloppy picture of the situation. The walls are actually plywood instead of drywall. The cabinets are plywood too. And there is another support "rail" beneath the cabinets. The screws are flat head 3" ones. a real photo would be best. The rail is on the inside, right? That's how mine are built. Mine were prefinished so I just have screws showing. 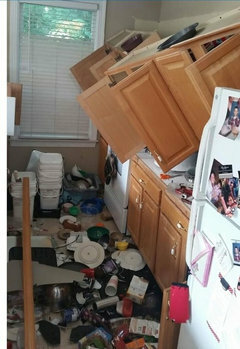 Unless your doors are glass and you don't plan on filling your cabinets with stuff, ignore them. Nobody is gonna accidentally rub the paint off like they might on a door jamb. Drywall screws is the nail in the coffin. Plus no proper spacing for an inside corner. The glue smears at the joins. You are dealing with a complete and total hack. Have him take those down and give your money back. Buy IKEA. Protruding screw heads are the least of the problems here. 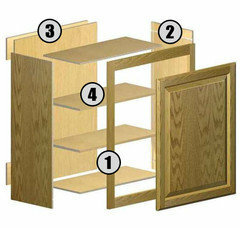 There are much better ways to design a corner cabinet so the corner is useful. How are doors supposed to fit on those cabinets? 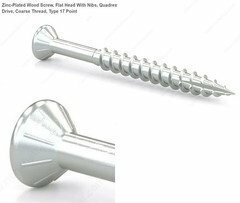 drywall screws are the wrong screw to use, you need the cabinet washer style. Looks like an amateur install. Reminds me of the guy a contractor hired to install mine, the guy did not know what he was doing, and the contractor had to buy me a few replacement cabinets and get his top guy to fix the mess. What kind of computers do you guys have? I can't tell what those screws are on mine. That is a hackorama on multiple fronts. Sorry, but none of that is acceptable.He doesn't know what he is doing. Get your money back. Fori...yes, I can’t zoom in on those screws...also that type of blind corner is a pita, but not uncommon. I inherited two in my current home. 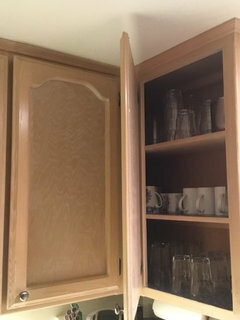 My doors open just fine because they are not full overlay on front of cabinet. 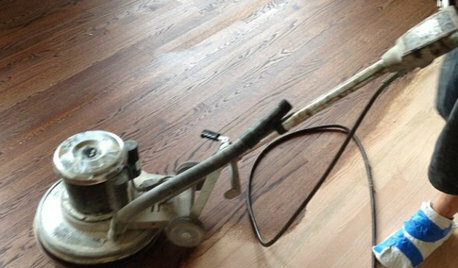 It has worked for nearly 30 years...but will not survive the kitchen remodel . Chard fan, if you're going to be putting doors on, don't even worry about them. Prime and paint over them if you paint the insides, or don't. Nobody will notice. I don't see glue smears. I see sanded wood filler. Why should that be a problem on the face frame of a painted cabinet? I don't know why these won't sink in all the way in the support rails and a few other places, but will sink in mostly everywhere else. 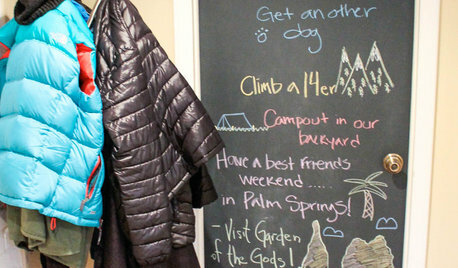 Our cabinets are plywood and the walls are not drywall; they are also plywood. Behind the plywood are studs. There is no drywall. No one has any ideas on why these won't sink in? Are they spinning or just refusing to move? Sounds like you have weird walls. Sometimes in weird walls, you just hit something hard. sometimes there might be a hard knot in the wood that makes it hard for the screw to sink in. the screws could also have gotten stripped. maybe you can try screwing into a new spot? If the screws are just going into plywood then at 3", they are too long. You are running out of thread. Try a thicker screw (if using the same holes) that is shorter. These are inside the cabinets, correct? I'd just prime and paint as normal, making sure to monitor for drips on where the screws project slightly. Once everything is painted and the shelves are in it's highly unlikely you will even notice this. 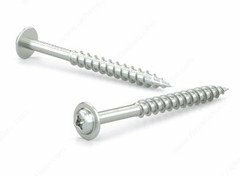 I’d urge you to go through and replace all of the drywall screws with proper cabinet installation screws with the larger heads, shown above. 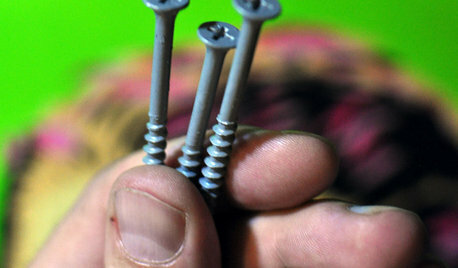 Drywall screws have no shear strength. The heads can snap off under sideways loading. This is what happens then. Swiss chard, see my response above regarding the screws. Your screws are spinning because they are not gripping into whatever is beneath. That is the only explanation. Since you say your walls are plywood behind, ksc36 is probably right regarding the shank length. Personally I wouldn’t trust any type of screw being fastened into just plywood. 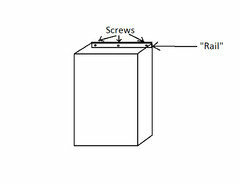 Purchase some GRK screws with a screw profile like ksc36 described. catinthehat, are they designed to be able to countersink enough to just put a little spackle on top, and then prime and paint? My husband just informed me that he also tried 2" drywall screws of the same profile I posted earlier and they wouldn't countersink either. However, if you don't hit the stud, no screw will countersink. These have better holding abilities. I prefer not to countersink my screws when attaching to a wall. When you countersink, you actually reduce the amount of wood that is between the screw head & wall the screw head could tear through the wood if too much weight is placed in the cabinet. More wood = greater holding. If you don't want to see the head, use caps or paint to match interior colour of cabinet. Design Loft, thanks for that reply. What you said makes sense. But I have one more question. Lets say I did use those screws that you linked to. Will I have any problems with the paint covering those screws in a few years? I ask because when DH and I bought our house, there was a cabinet in the bathroom that had nails underneath the white paint, and the nails were rusting under the paint, and you could see the rust finding its way through the paint and creating a reddish brownish dark spot there. Why do some nails/screws rust under paint and others not? And I suppose then that the screws that did countersink, did so because they found a stud. So that makes me feel better; at least now I know that about a third of them found a stud. DH said that he can eliminate the entire problem of protruding screw heads by covering with a 1/4" wood layer and nailing that wood layer on top; he says the nails will countersink. And then we can Spackle, prime and paint. Perhaps we will go that route.